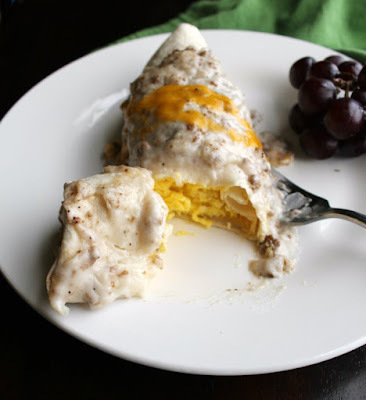 Serve up a hearty and delicious breakfast with these smothered breakfast burritos. 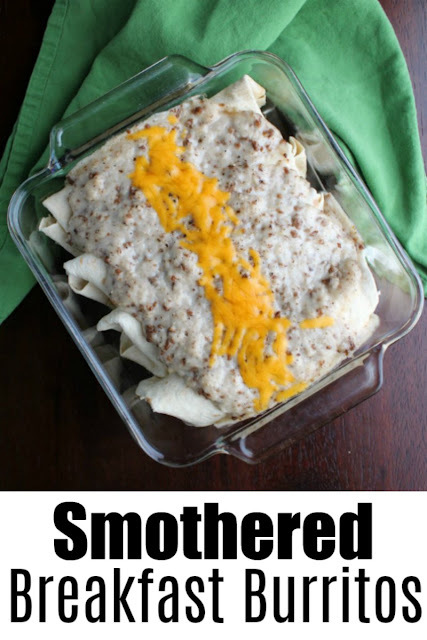 They are filling and delicious and perfect for breakfast or dinner! 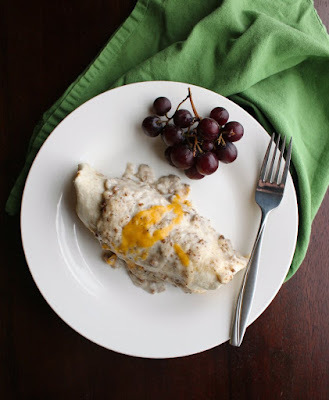 Fluffy eggs and cheese tucked into a soft tortilla and smothered in sausage gravy. What's not to love about that? 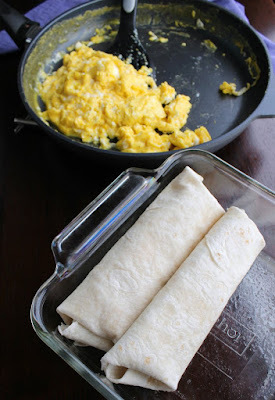 These yummy burritos are the perfect savory start to the day. But they are substantial enough to be welcomed at the dinner table as well. If you are looking for a nice, hot, fill'em up breakfast, you are definitely in the right place. These burritos are sure to fill your belly and keep you going all morning long. We are not huge breakfast eaters during the week. Little Dude always has something before he heads off to school, but my husband and I are much more likely to grab a coffee and go. On the weekends, sometimes we enjoy more of a brunch type meal. Something filling and delicious in the late morning. So it kind of counts as a late breakfast or maybe it's an early lunch. Either way, it pays for it to be filling so that we can make it to dinner without a ton of snacking. These burritos are the perfect thing. There is a great mix of filling ingredients with both protein and carbs to keep us satisfied and energized. That is good because we tend to try to do "all the things" on the weekend! When gardening, games of tag, cleaning the house, and a million loads of laundry are all on to-do list, we need to be fueled! Sausage gravy freezes well, so you can make a big batch and freeze it in smaller containers. Then when you need a couple of cups for things like biscuits and gravy or these burritos, you can just pull some out and warm it up. I kept these pretty simple for a couple of reasons. The first, because this is what I had on hand. The second, so Little Dude would like them. However, I think they would be great with some sauteed onions and peppers in them as well. Or you could add cubes of potato like I did in the breakfast chimichangas! Really you could put any of your favorite breakfast burrito fillings in there. The smothering of sausage gravy just takes these babies to the next level of goodness. Go ahead and put these ingredients on your shopping list and make plans to make a batch soon. You will be glad you did! What are your favorite hearty savory breakfast dishes? Preheat oven to 350F and grease a 8 or 9 inch square pan. Melt butter in skillet. Beat the eggs and milk together. Pour eggs into skillet and cook until just barely set. Season with salt and pepper. Place 1/4 of the eggs on a tortilla. Sprinkle with 1/4 of the cheese. 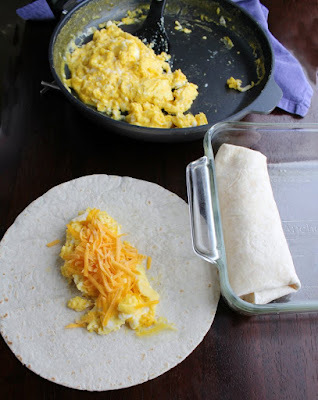 Roll up into a burrito and place in prepared pan. 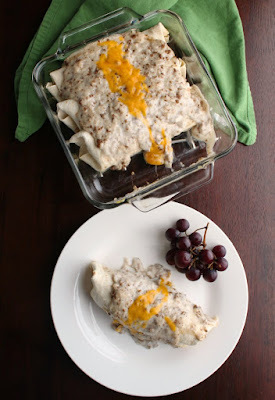 Spread gravy over burritos and bake for 20 minutes. Sprinkle with a bit of additional cheese and bake for 5 more minutes. Serve warm and refrigerate leftovers. My boys are going to love this so much! What a great recipe my sweet friend, hope you have a great weekend! You had me at sausage gravy!! Yum! What a delicious and hearty breakfast. I never thought about putting gravy on top! My oldest son loves sausage gravy, thank you for the great idea! Why have I never thought of this...it's genius!! I can't wait to try this Miss Carlee. It sure does look AH-MAZING! 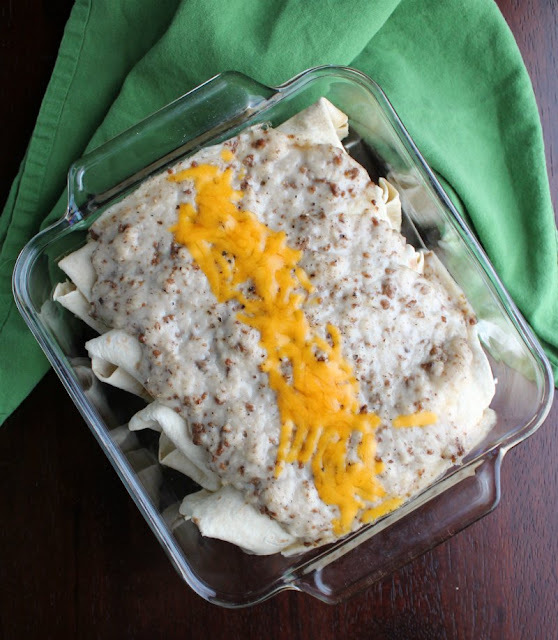 I would have never thought of freezing sausage gravy! I'll have to try these and see what my husband thinks. They will be on the edge of his breakfast comfort zone, but since your husband approves, I think I can pull it off!